The FMS/GPS unit’s nonsequencing mode provides an easy way to accomplish holding procedures. When instructed to hold at a waypoint that appears in the route programmed in the FMS/GPS unit, simply engage the nonsequencing mode prior to reaching the waypoint. With waypoint sequencing suspended, you can determine and fly the appropriate holding pattern entry, select the inbound holding course using the course selector (OBS in some) knob or buttons, and fly the holding pattern while timing the outbound leg. 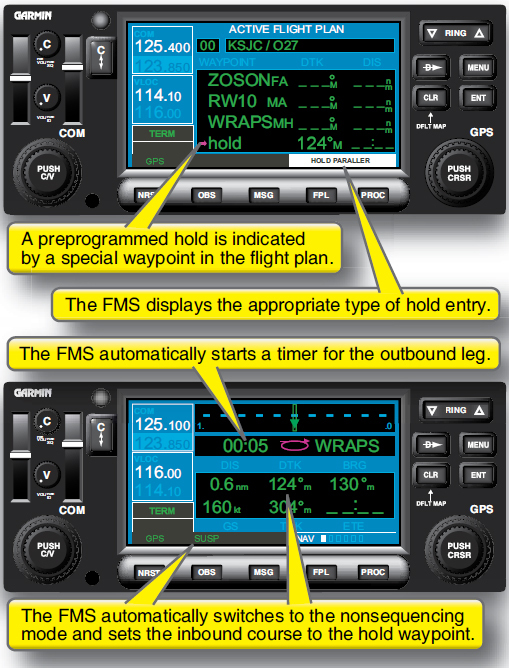 Some FMSs can automatically enter the holding pattern, and continue to hold if programmed. As the aircraft repeatedly crosses the holding waypoint with each turn in the hold, the holding waypoint remains the active waypoint. When you are cleared out of the holding pattern for the approach or to another point, you should select the sequencing mode or cancel the suspension before reaching the holding waypoint for the last time. When you pass the holding waypoint in sequencing mode, the FMS/GPS unit will then sequence to the next waypoint in the route. This procedure is demonstrated in Figure 3-43. 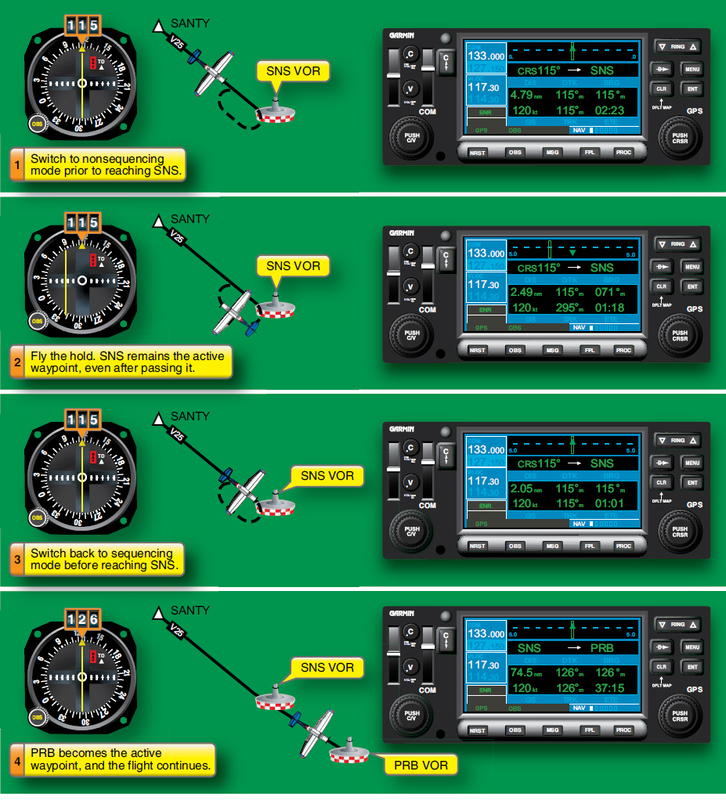 Some FMS/GPS units insert preprogrammed holding patterns into published instrument procedures. The purpose of a preprogrammed holding pattern is to relieve you of many of the tasks described above for flying a holding pattern. Figure 3-44 illustrates a preprogrammed holding pattern that appears at the end of a missed approach procedure. Figure 3-44. A preprogrammed holding procedure. As the FMS/GPS unit shown in Figure 3-44 sequences to a preprogrammed holding pattern, the navigation displays a message indicating the type of holding entry required based on the aircraft’s current track. The system then automatically switches to a special nonsequencing mode that not only stops waypoint sequencing, but also sets the inbound course to the holding waypoint. This special nonsequencing mode is different from the nonsequencing mode you engage manually. In Figure 3-44, this system uses the term suspend mode (SUSP) to signify the nonsequencing mode that is automatically engaged during a preprogrammed holding procedure. Depending on the type of holding procedure, the unit may or may not automatically switch back to the sequencing mode after the aircraft crosses the holding fix. As always, you must be careful to maintain constant mode awareness. Mismanagement of the sequencing and nonsequencing modes during a holding procedure is another common error. 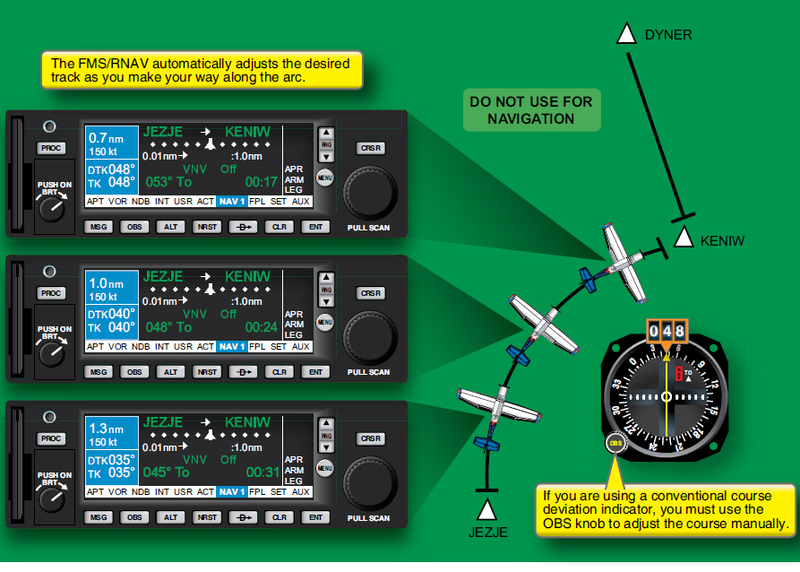 Failing to switch the FMS/GPS RNAV to the nonsequencing mode prior to reaching the holding waypoint, or prematurely switching the unit back to the sequencing mode once established in the hold, can prompt the FMS/GPS to sequence past the holding waypoint. In this case, you are left without guidance along the inbound holding course. Select a preprogrammed holding pattern, or nonsequencing mode. Select and setup a non-preprogrammed holding pattern inbound course. Determine the proper sequence of software commands for the holding pattern, transition to approach, approach, and MAP navigation. FMS and some GPS units simplify the problem of tracking arcs, which are curved courses between waypoints. The key feature of an arc is that there is no one bearing that takes you from one waypoint to the next. Rather, depending on its length, an arc requires you to follow a gradually changing heading toward the active waypoint. The example in Figure 3-45 illustrates how an FMS is used to fly a DME arc procedure. Select an approach procedure with an arc. Select the course, or determine that automatic course CDI setting will occur.